Club Penguin: How to Become a Puffle Expert 2014 Cheats and Guide! To become a Puffle Expert you first need to go to the Puffle Hotel. Don't know where it is? Click on your map and click the Plaza icon. The Puffle Hotel is located right next to the Puffle Shop. There are many cool jobs to have on CP. If you want to become a tour guide then take a look at how to become a tour guide on CP. Next, you need to click on the yellow peice of paper with the green check mark on it located at the bottom left of your screen. Now all you need to do is complete four tasks. 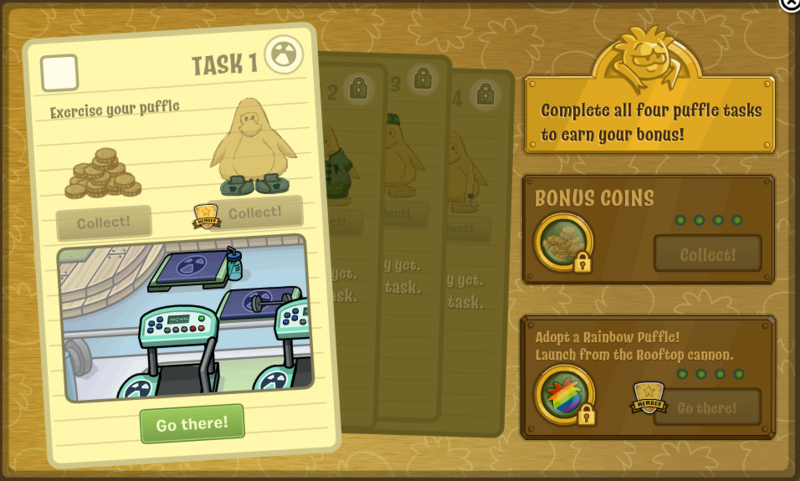 Each task gives you coins and if you're a member on Club Penguin you can collect one peice of the puffle expert costume per task. In the end, all of the peices of clothing you collected in each task will become a complete costume.